A Diamond Bar man died in a four-car crash on the 60 Freeway. George Deirkarkourian, 23, was pronounced dead at the scene on the eastbound 60 west of Brea Canyon Road in Diamond Bar, the California Highway Patrol said. Officers said Sheng-Ting Shih, 32, of Walnut, rear-ended Deirkarkourian’s 2001 Ford when traffic slowed for a road closure at 2:06 a.m. The impact propelled the Ford into the back of a 2011 Chevrolet and the side of a 2006 Toyota. Paramedics took a 30-year-old Chino Hills woman riding in Shih’s 2012 BMW to a hospital as a precautionary measure. There were no other injuries. Officers arrested Shih on suspicion of driving while under the influence of alcohol.The crash forced the closure of four eastbound lanes for about two hours. As part of the Buddha’s birthday education project, the Hsi Lai Temple will offer a special exhibit this weekend and next in Hacienda Heights. “Through These Doors: Connecting Past and Present, East and West” presents a unique perspective of Buddhism’s journey from India by way of the Silk Road. Visitors will be immersed in medieval China as they peruse the fascinating exhibits. “Through These Doors” promotes a better understanding of Buddhist history through the free multimedia exhibit focusing on Buddha’s Birthday celebrations in medieval China. If I were a matchmaker, I’d match the performing arts department at Diamond Bar High with “Fiddler On the Roof.” Fortunately, they already have, selecting the perennial favorite for the big spring musical that opens tonight at 7 p.m. in the high school theater. One would think they’d have a hard time finding someone to play Tevye, a Jewish dairyman trying to raise four daughters in Czarist Russia. Think celebrated Israeli actor Topol or the legendary Zero Mostel, who made the role famous in the Tony Award-winning musical that ran on Broadway for more than 3,000 performances from 1964 to 1972. Not 17-year-old Charlie Luber. This is the high school student’s first big role. But 15 minutes in the makeup chair transforms the soft-spoken young actor into a very likeable Tevye. Charlie actually ages before your eyes from a young, clean-shaven Brahma to an old bearded peasant. And while he may answer questions quietly in the dressing room, Charlie becomes a commanding presence on the theater stage. If anything, the sparkle in his eyes burns even brighter. Read more in Rich Irwin’s story FIDDLER. Michael Gregoryk, vice president of Mount San Antonio College, and Ruben Frutos, deputy superintendent of the Rowland Unified are serving on the newly formed seven-member oversight board of Industry’s Redevelopment Agency. The new era in the history of one the most powerful redevelopment agencies in the state began Tuesday with a clash of the titans between county Supervisor Gloria Molina and former redevelopment heads with the city of Industry. Though Industry’s redevelopment agency was dissolved Feb. 1, as required by a state law passed last year, the divvying up of the agency’s assets and the paying off of its obligations began in earnest when Molina appointed herself to a state-mandated board to oversee the agency’s dissolution. The newly formed seven-member oversight board met for the first time Tuesday and began discussing the legality of millions of dollars in contracts that it must decide by May 4 whether or not to pay. Some ongoing costs listed by Industry include: $73,000 a month for one law firm; $15,000 a month for a company to write laws and lobby; $2,000 a month for a consultant and $40,000 for a civil engineering company, among other related expenses. Molina said her job will be to play a kind of county cop, to decide which of the expenses are legal obligations that need to be paid and which ones are not. She said she will make sure Industry follows the law when returning the property tax increment – collected for years by the redevelopment agency – to school districts, college districts, the county coffers and the county fire district. Read more in Steve Scauzillo’s story INDUSTRY. Children can get up and moving when Twinkle Time comes to the Hacienda Heights Library tonight from 7 to 8 p.m.
Hacienda Heights native Alitzah (like Pizza) Wiener will wow the kids with her high energy, bilingual pop music show. With a twinkle in her eye, Wiener created a colorful children’s character. The petite Latina turned into Twinkle, a girl with bright orange hair, bright pink tutus and lots of glittery star-shaped jewelry. “It wasn’t that much of a stretch. My family said I used to dress like Rainbow Brite or Punky Brewster when I was growing up,” she said. While adults might find the bright colors a little intimidating, little kids seem drawn to the colorful character. Next, Wiener set out to produce “Twinkle Time” a high-energy family music show. Twinkle gathered a cast of friends to entertain area children. She also wrote some new songs for the tykes. “I wanted them to be catchy tunes, but I still wanted to teach valuable lessons through them,” she said. Families will want to check out the exciting show later in the month. The Hacienda Heights Library is at 16010 La Monde St.
For more, read Rich Irwin’s story TWINKLE. Deputy District Attorney Stacy Okun-Wiese was honored at the 28th annual Justice for Homicide Victims Memorial at Rose Hills Memorial Park. She, along with her partner, Pak Kouch, and sheriff’s Sgt. 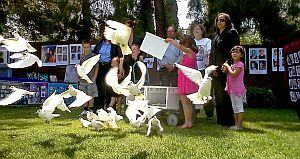 Sandra Nava and Detective Don Walls were honored for their work in the conviction of Manling Williams, who murdered her husband, 27-year-old Neal Williams, and their sons Ian, 3, and Devon, 7, in their Rowland Heights home in 2007. A judge sentenced Manling Williams to death in January. “I wouldn’t have been able to get through this without my team of detectives (and prosecutors),” said Jan Williams, the mother of Neal Williams and grandmother of Devon and Ian. Read more in Brian Day’s story JUSTICE. Want to know who to vote for in the races for Los Angeles County Superior Court judge? Come here what they have to say about the issues. The 18 candidates for the contested judicial races have been invited to attend a candidates forum at 10 a.m., Saturday at Steinmetz Park in the Steinmetz Community Center, 1545 S. Stimson Ave. The judicial candidates forum is free and open to the public. The Honorable Robert Bonner, a former U.S. District Judge, will be the moderator. 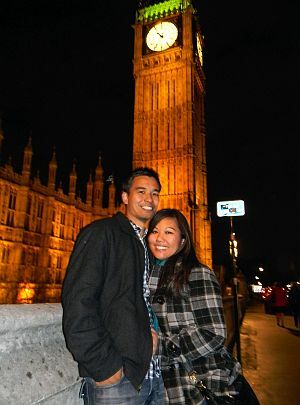 Ryan Easton ogled Big Ben and googled the top tourist attractions in London. Which was only appropriate because the Nogales High teacher was in Britain’s capital city for Google’s Teacher Academy the first week of April. Easton was one of only 50 educators from around the world, including six from California and 13 from the United States, chosen for the innovative academy. Some of the top teachers from around the globe gathered to share their passion for using innovative tools to improve learning. The Internet giant joined the instructors to show them emerging technologies that will help them in the classroom. Read more in Rich Irwin’s story EASTON. In a dramatic reversal, the third seat in last week’s close Walnut City Council election went to challenger Eric Ching, who edged out candidate John Saleeby by 32 votes Monday morning after hundreds of provisional and vote-by-mail ballots were tallied. Incumbent Nancy Tragarz, who came in first place, retained her lead, ending up with nearly 25 percent of the vote. Incumbent Anthony “Tony” Cartagena held on to second place with 20 percent of the vote. Ching grabbed the third seat despite trailing Saleeby by 51 votes after the initial vote count on election night, April 10. That night, Walnut City Clerk Teresa De Dios said the city had a high number of ballots left at polling places that had yet to be counted, placing Saleeby’s victory in jeopardy. On Monday, the city counted 622 additional ballots and Ching gained 335 additional votes, creating an 83-vote swing to overtake Saleeby and capture the last seat. That seat was left open by Councilman Joaquin Lim, who decided not to run. Lim had thrown his support to Ching. “I think this was a roller-coaster from the start to the end,” said a smiling Ching at the council chambers Monday after the final tally was revealed. Ching was buoyed by the fact that most of the ballots left uncounted until Monday were from permanent absentee voters who dropped their ballots off either at City Hall or at Walnut polling places on the day of the election. Voting by mail tends to be favored by Chinese-American voters and that benefited Ching, something he predicted last week. Even Saleeby agreed that was part of the reason why he lost. Read more in Steve Scauzillo’s story ELECTION. It ain’t over until it’s over. And this one won’t end until this morning. That sums up the Walnut City Council election, left in limbo Tuesday night by 645 uncounted ballots and a pending claim of polling place incompetence in a race in which at least 2,135 people voted. “There could be a change,” said City Clerk Teresa De Dios Wednesday afternoon, after dropping off provisional ballots for verification with the Los Angeles County Registrar-Recorder County Clerk’s Office in Norwalk. She and electoral consultant Linda Gair are working with the county on verifying all untabulated ballots. They say they will reveal new vote totals at 11 a.m. Monday. The count will be open to the public and take place at the City Council Chambers at 21201 La Puente Road. Although first-place finisher Nancy Tragarz, the current mayor, is well ahead with 2,135 votes, the battles for the second and third spots on the five-member council are much closer, and the outcomes remain uncertain. Tony Cartagena, a 12-year council veteran, came in second in the unofficial tally with 1,746 votes. Challenger John Saleeby took the third seat with an even 1,700 votes. But once the uncounted ballots are tallied, Saleeby could be overtaken by fourth-place finisher Eric Ching, who with 1,649 is only 51 votes behind. It would be unlikely for fifth-place finisher Michael West, with 1,333 votes, to leapfrog over Ching and Saleeby into a council seat.